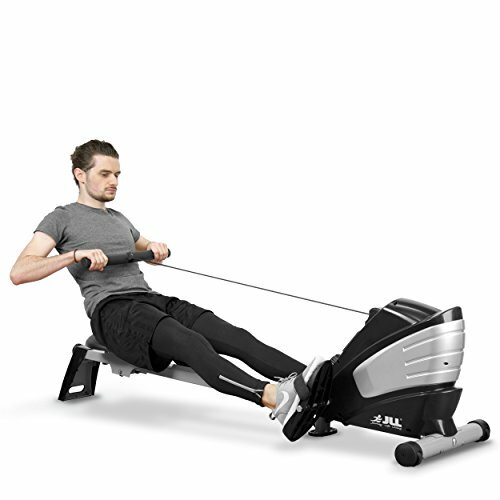 If you’ve read my guide to the best rowing machines around you’ll likely have seen this one in there and you’ll know that I rate it really highly as a machine that’s great for those on a budget. Read on for my JLL R200 review for a more in depth look at this item. As I just stated, this is a great budget rowing machine and if price is a concern for you, yet you also want to get a professional machine I definitely think this is one that you should be looking at. JLL have a reputation for building good quality fitness machines while also keeping prices low and I’ve heard many positive reviews of them as a company. 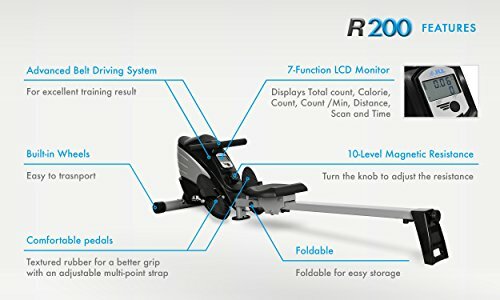 The R200 rowing machine is a great all round rowing machine that doesn’t try and do too much as some other machines do (i’m thinking of the other machine I reviewed in this price range). It’s a rowing machine, plain and simple. I always like to think that you don’t really want a ‘jack of all trades’ machine – you want one that is designed solely for your purposes and this one is that. It looks great as a machine in black and silver and is a really professional standard, sturdy machine – it definitely doesn’t make you think that you’ve invested in one of the cheaper options around. Rowing machines can be really noisy, and this is a problem when choosing something for at home. The R200 has magnetic resistance and that not only makes it a quiet machine but it also means that the rowing movement is extremely smooth as well. The resistance is also adjustable with 10 levels for you to choose from meaning that as your fitness levels increase and you want and more intensive work you can change up easily. It’s fairly basic, but I think for a machine like this is does all that you need it to do. Overwhelmingly positive! I do like to scan all the buying sites around to get an idea of what others think as I believe this is important to the bigger picture. Most people find it a great budget machine that’s easy to use with the only downside being that some think that even on the highest setting it’s not as strong and providing as good a work out as they’d like. Obviously your mileage will vary on that one as to what your current level of fitness is. Overall, for the price, I think you get a lot for your money. You don’t get the sophisticated computers on the higher end machines but I think that’s probably to be expected and so long as it can track what exercise you’re doing, I imagine most people are fine with this. For most people’s use, which is at daily and at home it will be great for increasing your fitness, improving your cardio and also helping to lose weight if you so desire!